Every now and again there is that something that happens that does not quite semm possible some how. Thats what we have got in Beau - he is machine like. Never stops - I am sure he must have some duracell batteries hidden away somewhere that keeps him going. When the rest of the team are gasping for air he seems to go on and on and on and on...........you get the picture now. 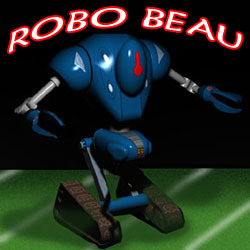 So what does ROBO BEAU bring to the field? He can cross the ball - well!!! He can score as well.......!!!!!!!!...........Result. I know you are asking the question - what CAN'T he do? Well I know that he can't drink very much - he is a bit of a lightweight in that department.......oh and yes.....he has no idea when it comes to betting on the dogs. In fact, thinking about it - his brother is similar in so many ways. He can tackle, defend and pass............scoring, well there's no chance there and when it comes to drinking..........also a bit of a lightweight. Beau, got a message from your mum.........TURN THE GAS OFF!!!!!!!!!!!! Is it possible to have TWO ROBO BEAU's.......................?? ?